Having a more minimal closet has been a slow intentional process encouraged by our small space and marked by 2 pregnancies and all the body changes that go along with that (I gained 50 lbs on my 5'2" frame with both pregnancies!). 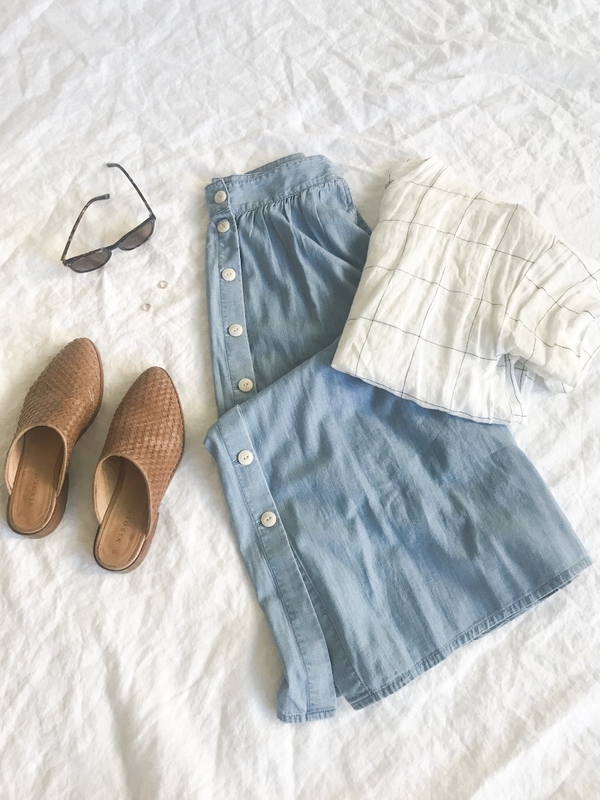 My closet is not a perfect minimalist closet or capsule wardrobe but I have been steadily getting rid of clothes that don't fit, don't last and are fast fashion and replacing them with more timeless pieces that are better quality. I am not all the way there yet but I hope there is value in sharing a work in progress. Part of it is age I think, knowing and accepting my body instead of fighting it. I know what looks good on me and what doesn't but when I was younger I would try looks and sillouettes that looked great on others but not on my small square frame. I have now embraced more of a uniform of striped shirts, flowy blouses, rompers, wide leg jeans, black skinnies and a handful of dresses. I have also learned that a good coat and a go-to pair of shoes for every season and weather in Vancouver is critical and makes me look put together even when I don't feel that way. I have one good coat and one good pair of shoes for each season and each usually lasts me 2-3 years. Similarly with shoes, I have learned that with our walkable lifestyle and chasing after little kids, I need quality shoes. When I packed up my winter clothes this year I took note that I was only packing away 5 sweaters, one turtleneck, one flannel shirt and a sweater dress (that I ended up donating thanks to a helpful push from a reader ;) ). I also packed away my winter parka I've had for 4 years and the wool coat I've been wearing for 2.5 winters. Part of this small pack up is because I have been trying to have many of my pieces transition through all seasons with layering. And part of it is the uniform concept of only wearing the things I really love over and over again. I will say that with the adoption of this method, by the time I'm done with something in my closet I have really worn it out and consignment isn't an option for me. I find this way of organizing my wardrobe helps with decision fatigue too. Between work, parenting two children, my marriage, this blog and maintaining friendships, life can be wonderful but overwhelming. I like that I can look at my small wardrobe, where most things go together and choose an outfit in a few moments. I may look the same most days but that's fine by me and in the end, no one else cares! I'm not sure if a list helps more or photos (let me know)? So here is a list and a couple of pics of outfits I wear or plan to weekly... please be kind as I am not a fashion blogger! 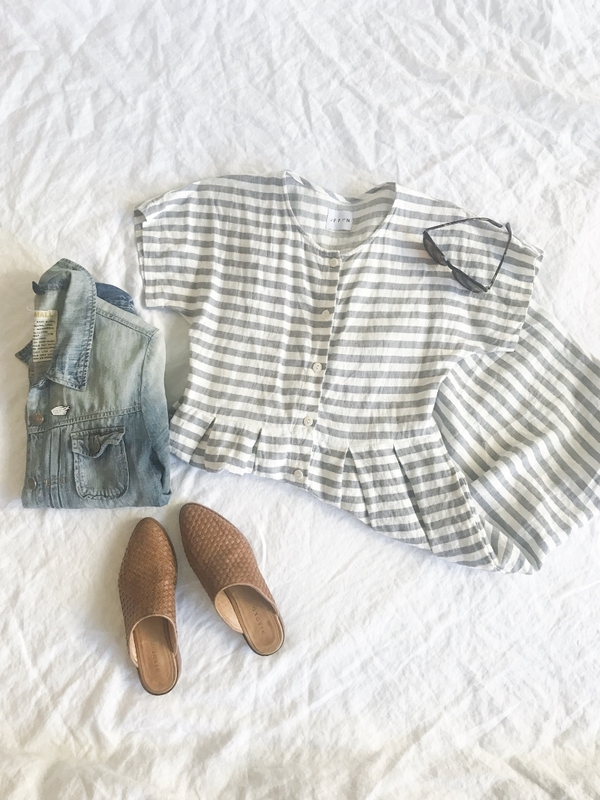 Many of my summer clothes are only 1-2 years old as I was either pregnant or postpartum over the past 5 years and didn't invest in summer clothes until recently. My mainstays are listed below with some links. I added years owned inspired by Vancouver stylist Elim Chu who is a great source for ethical and vintage fashion. I am also inspired by Erin Boyle of Reading My Tea Leaves and hope to move my closet closer to more sustainable and ethical choices as I educate myself on where my clothes are made. There is much more to say about clothes and I hope to write more about it soon including caring for and repairing the clothes we have (I just took an embroidery class and I think it is very transferrable to mending!). Most Asked Question: When will we move out of 600sqft?